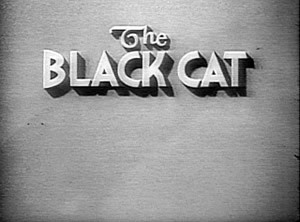 Edgar G. Ulmer is famous principally for The Black Cat (1934) and Detour (1945). These stylish and eccentric works have achieved cult status, but Ulmer’s other films remain relatively obscure and his reputation is far from assured. Although he designed for Max Reinhardt’s theater, served his apprenticeship with no less a master than F. W. Murnau (notably on Der letzte Mann  and Sunrise ), and worked with collaborators as distinguished as Robert Siodmak, Billy Wilder, Fred Zinnemann, and Eugen Schüftan on Menschen am Sonntag (1929), Ulmer has not received comparably wide-ranging respect. 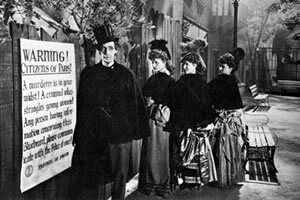 This is due to a career spent mostly in Poverty Row cinema: after an early success at Universal with The Black Cat, Ulmer, for both personal reasons and a desire for creative independence, left the major studios behind. He specialized first in “ethnic films,” notably four in Yiddish, and then found a niche making melodramas on miniscule budgets and with often unpromising scripts and actors for lowly PRC (Producers’ Releasing Corporation). Through the rest of his career, Ulmer worked for low-budget enterprises in America and Europe, his range extending from a second-rank spectacular like Hannibal (1960) to a nudist movie (Naked Venus ). He directed his last film, The Cavern, in Italy in 1964; several years later, he suffered a crippling stroke, and died in 1972. One might argue that the critical neglect of Girls in Chains (1943) and Daughter of Dr. Jekyll (1957) is something less than a tragedy; and one cannot deny that Ulmer produced a lot of dross. However, amidst the dross is much that is beautiful and that deserves attention: close examination of Ulmer’s oeuvre shows how often he could transform straits into opportunities, making productive dissonances of inconsistencies and poetry of deficiency. My view that it is time to reexamine Ulmer has apparently become more widespread in the last few years. Arianne Ulmer Cipes, the director’s daughter, has been on a campaign to locate prints of Ulmer’s elusive films (many of which were shown in 1999 by the American Cinémathèque in Hollywood); All Day Entertainment, in conjunction with Cipes’ Edgar G. Ulmer Preservation Corporation, has released several his works on DVD, (1) and Internet video outlets have improved access to many of Ulmer’s more obscure films (although I must acknowledge that there are many I have yet to see). This increasing availability coincides with signs of renewed critical interest. Biographical studies of Ulmer are in the works, and studies of Yiddish cinema of the ’30s have also reawakened interest in Ulmer. (2) Of course, Ulmer has long enjoyed a small but fervent critical following. In the ’50s François Truffaut and Luc Moullet at Cahiers du cinéma praised him—Truffaut even cited The Naked Dawn (1955) as an inspiration for Jules et Jim (1961) and described Ulmer as consistently “fresh, sincere, and inventive.” (3) Later, Jean-Luc Godard dedicated Détective (1985) to Ulmer, among others. Several American and British critics have written of him appreciatively; and Peter Bogdanovich conducted an indispensable interview not long before Ulmer’s ultimate physical decline. Still, much remains to be explored in Ulmer’s work. One casual and condescending way of approaching Ulmer is simply to enjoy the vivid moments that punctuate what may be generally lackluster films. These moments may represent excesses of either inadequacy or inspiration—not that it is always easy to decide which, since they are by definition exceptional, and thus extrude disruptively from the general texture. Relatively clear-cut examples of inadequacy might include any number of miserable performances that crystallize into unintentional hilarity, or the frisson of badly matched stock footage that undermines plausible continuity (as with the bits of Erle C. Kenton’s Island of Lost Souls  used in Beyond the Time Barrier ). These, however, are not specific to Ulmer’s work: they are familiar pleasures in films made on negligible budgets; and closer familiarity with Ulmer underlines how inadequate this mode of (in)attention really is. Elsewhere in Ulmer’s works isolated moments may generate not amusement but bewilderment or awe. Perhaps the most beautiful is a sequence in The Black Cat, in which the camera detaches itself from the action to roam through the underground passages of Boris Karloff’s mansion; here Ulmer prefigures the elegant and ghostly fluency of Alain Resnais’ L’Année dernière à Marienbad (1961). Whereas this scene is principally formal and atmospheric, a similar shot in Strange Illusion (1945) is more specifically functional. 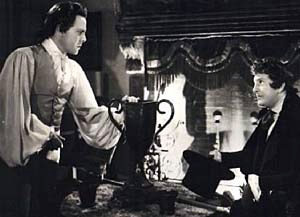 Here the protagonist (Jimmy Lydon) continues his dead father’s investigation of the man who has become his mother’s suitor; while he studies his father’s files, the camera slowly drifts away from him, tracking around the room to the father’s portrait, suggesting with striking efficiency and power the posthumous fulfillment of the father’s will. Some of Ulmer’s films offer little besides such memorable moments. However, many details reward more active attention, and gain specificity and resonance when considered in larger contexts. In fact, although Raúl Ruiz has noted that such films as The Black Cat break up into “a series of situations, each with a life of its own,” (4) examination shows that Ulmer’s work—however variable its quality—remains remarkably consistent, both in style and in its themes of fate and responsibility. Whether the focus is on the psychology of individuals, on contexts of creation and exploration, or on broader images of culture and society, Ulmer creates ambiguous “morality plays,” as he himself asserted. (5) The audience must work to discriminate kinds and degrees of culpability within the films’ apparently stereotyped but actually complex representations (manifestations?) of consciousness and motive. John Belton has written that Ulmer’s characters are “powerless prisoners of an irrational series of experiences which they can neither understand nor control,” and suggests that “they repeatedly surrender themselves to their intuitive but irrational impulses,” existing “only as passive reactors to what happens to them.” (6) I think this is an oversimplification. One should not dismiss Ulmer’s characters as puppets but recognize the difficulty of distinguishing fate from imperfectly conscious motivation. What in his characters is will, and what destiny? Is the active character more or less at the mercy of controlling forces than the passive? The “irrational experiences” of which Belton writes arise often both from external pressure and internal susceptibility, and the two forces more often reinforce than impede one another. Only violent ruptures can break the mutual determination of character and fate—hence the importance of the coincidental or the arbitrary in Ulmer’s films, and the frequently frustrating nature of his “resolutions,” which may be, in terms of inner necessity, nothing of the sort. One may, as does Belton, connect this pessimism to the development of Ulmer’s own career. (7) To be sure, one should guard against interpreting Ulmer’s fall into the depths of PRC as a simple mirror of the doom saturating his most famous films; life rarely enters work without distortion, and one should resist easy biographical explications, especially when the available biographical evidence presents a man of enormous vitality and charm. Still, Ulmer’s personal ambivalence does resemble the unresolved tension between compulsion and choice that throbs throughout his work. On one hand, he claimed that working in poor circumstances preserved his freedom: “I didn’t want to be ground up in the Hollywood hash machine;” (8) and, certainly, one may think of other remarkable directors (for example, Joseph H. Lewis, Budd Boetticher) who found in genre films ample conditions for elegant invention and expression. 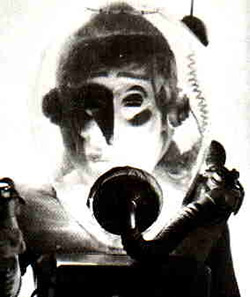 On the other hand, sounding rather like Dr. Ulof (Ivan Triesault) in The Amazing Transparent Man (1960), he poignantly asserted that “I really am looking for absolution for all the things I had to do for money’s sake,” (9) expressing both a perception of what Andrew Britton has identified in Detour as “the grotesque deformation of all human relationships by the principles of the market” (10) and a guilt that may remind us of its pathological variants in his films. Why, for example, in Journey Beneath the Desert (1961), does Pierre (Jean-Louis Trintignant) feel so responsible for his friends’ deaths, since they had undertaken their attempts at escape quite independently of him? The answer that the evil queen could use him only “because [he] harbored hatred in [his] subconscious” is inadequate, indeed apparently irrelevant to the character’s situation. One might also point to the title character (played by Gloria Talbott) of Daughter of Dr. Jekyll, who believes she is guilty of murder, and is willing to submit to death or imprisonment on the evidence of dreams and inconclusive circumstances. (Compare, too, Eden Lane’s [Barbara Payton] flight and submission to arrest in Murder Is My Beat , both of which seem inexplicable given her actual degree and experience of responsibility.) 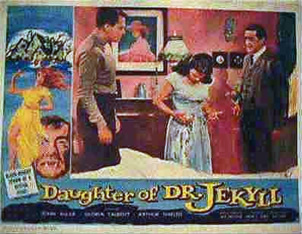 As we later learn, Dr. Jekyll’s daughter is actually innocent, her dreams triggered by drugs and hypnosis—a fact that reminds one how frequently Ulmer’s characters are subject to forces that remove their volition (such as the alien’s power in The Man from Planet X ; the chess game for control of the young couple in The Black Cat; and, arguably, the dead father’s influence in Strange Illusion). Ulmer can sometimes show little interest when his characters manage to escape their fate, self-willed or not. Witness the incredibly perfunctory “happy ending” of Dr. Jekyll: the heroine’s emancipation has no resonance at all. When the three survivors escape The Cavern, Ulmer leaves them in mid-action, descending a hill, with no one else in sight—a curiously inconclusive image, despite the grand words “Let there be light” on the soundtrack. We may begin with Bluebeard. Its protagonist is Gaston Morel (John Carradine), a puppeteer who is secretly the painter and murderer of numerous women. The women are apparently procured by his art dealer Lamarté (Ludwig Stossel), who profits exorbitantly from Morel’s paintings. Ultimately Morel’s secret is discovered by the dressmaker Lucille (Jean Parker), to whom he reveals that he has long associated painting and murder. He had loved and idealized a sick girl, and painted her as Joan of Arc; however, she proved a cruel strumpet, and he killed her in a fit of rage. Ever since, he has been unable to control himself, especially as abetted by Lamarté; only Lucille has revealed a new love and hope to him. However, it is too late: among the women he murdered is Lucille’s sister. The police arrive as he attacks Lucille, and in the ensuing pursuit Morel drowns in the Seine. Morel represents himself as, and is taken by Lucille to be, fundamentally sensitive; and his talents as a puppeteer and as a painter are accepted as genuine (although what we see of the latter is surely among the most bizarre and anachronistic examples of “movie art” ever). However, Morel is more complicated, and disturbing, than that. To be sure, the murders would seem to be evidence of an inner compulsion; on the other hand, they are also economically conditioned, and what we see complicates things further. The killings that we witness occur not through uncontrollable passion, but are cold-blooded: Morel murders his assistant because she suspects his guilt and he has grown tired of her, his art dealer because he has betrayed him, Lucille’s sister because she has recognized him. We must take on faith the flashback with which he reveals his past to Lucille, and hold his declared capacity for idealizing love and intolerable sensitivity against his callous treatment of his assistant prior to her death. On the other hand, one can not go so far as to say that Morel is trying to delude Lucille with a false representation of his motives. He has indeed tried to abandon painting for the less fatal practice of puppetry—he may direct his rage directly and harmlessly at his puppets, whereas he is apparently helpless under the spell of his painting—but is repeatedly dragged back to painting by Lamarté’s rapacious demands and threats. Further, his feeling for Lucille seems genuine, and early on he both warns her from him and insists that he will never paint her, evidence of both his regard for her and his fear of his own urges. One may simply assert that Morel’s contradictory character is not really contradictory at all: that idealization is only the other side of misogyny, that it is fitting that Morel’s idealizing act of representation in painting accompanies rage against its imperfect source (compare Hawthorne’s “The Birthmark”), and that the caricatural nature of puppetry involves no such compulsion. Further, the painter is at the mercy of his fascination for the model, while the puppeteer controls his puppets outright. However true these observations may be, they aren’t fully adequate. Rather, Ulmer demonstrates the continuity of Morel’s propensity for murder not only with his normal desires, but with something self-willed in his economic condition as well. (13) In this light, the puppet show in Bluebeard immediately invites an allegorical reading, especially since it runs for a considerable length, and is recalled in a crucial moment late in the film: the flames of hell that mark the puppet show’s climax rhyme with a marvelous shot through a fireplace in Morel and Lucille’s last meeting, confirming the show’s distorted prefiguration of their love. There are three puppets, representing Faust, Marguerite, and Mephistopheles, who are rough “types” of three central characters: Morel; Lucille; and Lamarté (to whom Morel alludes as the character’s model). However, it is interesting that the puppeteers do not correspond to their puppets. Morel takes the role of Mephistopheles, while Faust is played by Morel’s comic-relief assistant, undermining nobility (and his own vocal glory) with his absurdity. This crossing of correspondences— destabilizing Faust, and by extension Morel, and associating Morel with his exploiter—suggests Morel’s complicity in his condition, an “identification with the aggressor,” to use a phrase of Adorno’s; and it distances us further from simply regarding him as a victim. The complicity of an artist in his own tragedy is also a theme in Detour. The pianist Al (Tom Neal) earns a meager living playing boogie-woogie in a cheap club. How much this prostitution of his talent is forced on him by his condition is unclear. According to his account, he is the victim of a relentlessly malevolent fate; but there is reason, as Andrew Britton has eloquently explained, to find him less than trustworthy. (14) Troubling dissonances emerge early in his account: his narration compares his past with his girlfriend Sue (Claudia Drake) to heaven, but what we see is that Al is already bitter, convinced of failure, and resentful of Sue’s career plans. However, as with Morel in Bluebeard, Al is also not simply falsifying the past: when he calls Sue long distance from the club phone, he seems genuinely excited by the prospect of joining her, and genuinely, even embarrassingly, in love (although this, as Britton suggests, may be [unconsciously?] motivated more by “a fantasy of her success” than by real affection). (15) Deep in both Al and Morel is a fundamental ambivalence which each senses at best obscurely. Al externalizes this ambivalence as fate; but, again, it is an open question how much this fate is imposed, how much self-willed: Al’s paranoid (and greed-driven?) decision to hide Haskell’s body renders it a self-fulfilling prophecy. 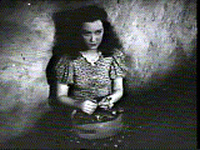 In other words, Al may indeed be a victim of fate, but he hardly cuts his losses: his incriminating assumption of Haskell’s identity, his immediate and craven acquiescence in the malevolent Vera’s (Ann Savage) plans, his diffidence about contacting Sue, and his excessively effective manner of silencing Vera obliterate any purported innocence. One may regard Al no less than Pierre and the daughter of Dr. Jekyll as desiring failure and ignominy, and deepening his susceptibility to them—he anticipates the classic David Goodis hero (certainly coming closer than the Charles Aznavour character in Truffaut’s Tirez sur le pianiste ). (16) Even the film’s ending is not necessarily a literal punishment: Al’s narration presents his ultimate capture by the police as a foregone conclusion, but sets it in the future—which means that the image of his apprehension is best interpreted as a fantasy projection, the logical extension of Al’s appetite for defeat. 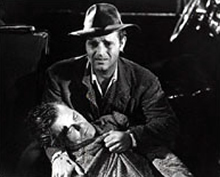 Ulmer establishes Al’s ambivalence not only through the narrative, and the relation between narrative and narration (this structural dissonance quite justifies Britton’s claim that Detour is “one of the most demanding and audacious narratives ever produced in Hollywood”), (17) but also in several musical episodes early in the film. In the club Al plays a gentle Brahms lullaby, but transforms it into a virtuoso and demonic boogie woogie; earlier he has dismissed Sue’s admiration of his talent, saying he has abandoned hopes of Carnegie Hall, except, maybe, as a janitor. These moments provide a succinct image of Al’s character. He travesties his own aspirations to “high culture” and refinement, using his talent for destructive ends, tied, like Morel, to his own commercial prostitution; but he lacks even the conviction of his power for desecration, treating this struggle within him off-handedly, with passive disdain. Al’s allusion to Carnegie Hall as the emblem of legitimacy and success suggests that one examine Ulmer’s 1947 film of that title, which proves, despite its radical dissimilarity of tone, genre, and surface, to reflect Detour‘s concerns. The connection is not immediately evident. If, as Britton writes, Detour is a film which communicates a “radical cultural impoverishment,” (18) Carnegie Hall is, by contrast, crammed with culture. Much of the film consists of musical performances by such masters as Heifetz, Rubinstein, Bruno Walter, and Fritz Reiner (Arianne Ulmer’s godfather). Linking these episodes is a rather thin story about a mother’s (Marsha Hunt) dream of classical stardom for her pianist son Tony (William Prince) as she works up the scale at Carnegie Hall from janitor (!) to a manager, a dream whose fulfillment Tony resists. Instead, Tony, like Al, mixes classical and pop music; but, whereas Al’s boogie woogie is a sarcastic disfiguration of the Brahms, for Tony pop is “fun,” “what people want to hear,” and is ultimately reconciled with “the classics” in his validating Carnegie Hall appearance with orchestra. (19) Again, it is tempting to read Ulmer’s own situation into these films, as an artist who descended from Murnau and Reinhardt to the depths of PRC, with Tony as a kind of wish fulfillment of finding artistic validity (or at least acclaim: his hybrid is disastrous aesthetically, although we are meant not to think so) in commercial culture. (20) Tony triumphs, his ambivalence translated into the happy coexistence of his competing attractions to high and low; but Al’s failure, Tony’s dark mirror as prostitute one step from doom, is more convincing and indelible. Ulmer himself recognized this, I imagine: he identified Detour as one of the favorites of his films. (21) Whatever the value of such speculation, Tony, unlike Al, faces ambivalence and resolves it triumphantly. There are other happy endings in Ulmer’s films, but few as unequivocal. If the happy endings of such films as Daughter of Dr. Jekyll and Murder Is My Beat seem arbitrary and slack, in Carnegie Hall the happy ending is not imposed from without, but earned. Although the thematic level of these films is not solely attributable to Ulmer, it is striking not only how often these themes of responsibility and fate recur, but also how well they fit in with Ulmer’s mise en scène. As an experienced and skillful set designer, Ulmer was an extremely sensitive architect of space in his films; and it is not surprising how often his spatial imagination is symbiotic with his recurrent themes of entrapment. (However, one should not ignore exceptions, like the luminous openness of Green Fields ). Another example, and, I believe, one of Ulmer’s finest achievements, is Beyond the Time Barrier. Thematically it is both rich and characteristic. As in Bluebeard and Detour, there is a doomed central figure; but this time his self-destruction is inadvertent, his character relatively neutral. Ulmer displaces psychological complexity onto the environment, in this case the dying culture into which the protagonist is plunged, and which is a dark extension of his (and our) circumstances. Once again, Ulmer’s representation of doom is sympathetic toward its victims, and yet leaves open the question of their degree of culpability. And, once again, Ulmer finds apt and striking formal manifestations for these themes—environments that encompass extremes of realism and stylization yet remain affectively consistent, compositions that are both functional and vivid, and an editing style that privileges meditation over sensation, making this one of Ulmer’s most moving films. Much is implausible or insufficient in Pierce’s story. One crucial omission is any clear understanding of the role of the mutants: why have they been consigned to the dungeons, apparently without food? We know that the mutants are violent; but it is not clear to what extent this violence is intrinsic or an enraged response to their segregation. The knowledge that the denizens of the citadel proper are “first-stage mutants” themselves does not clarify anything, especially since their kind of mutation bears no resemblance to that of the real mutants (who, for example, can speak). In general we come to know exceedingly little about the civilization of the citadel, or how it relates to the outside world whose “spies” it seems to expect. These are serious deficiencies: the most that can be said for them is that they contribute to the atmosphere of ambivalence that I have already suggested is characteristic of an Ulmer film. A more intentional ambivalence is the status of the hero, who is indeed fatal to the citadel, as the captain had feared. Trirene’s telepathy recognizes Allison’s good faith, but not the doom he will bring; instead, she betrays her society and achieves disappointment and death for herself. When the Supreme assents to Allison’s plan to return to the past, it is clear that his hope is born of despair: he hopes because there is nothing else he can do. Indeed, the Supreme’s laments are extraordinarily poignant, especially given Sokoloff’s endearing performance and the light they cast, for example, on The Cavern: “I fear our future is done. We have returned to the cave where man first lived on earth. We have returned to our birthplace to die… Now the shadow of death darkens the halls of our citadel. Our bright ray of hope is gone. It’s the end of us.” Of Allison’s project he can only say, “I pray that this you believe in is not a dream… I believe.” The film makes clear that this faith may well be inadequate to change the future: although the military brass of 1960 seem to acknowledge the truth of Allison’s warnings, there is no assertion that they will be able to counteract them. The fate of Allison, in any case, is grim: he has lost Trirene and has aged irrevocably and drastically. Andrew Sarris once remarked that “most of Ulmer’s films are of interest only to unthinking audiences or specialists in mise-en-scène.” (24) In the latter regard Beyond the Time Barrier is certainly a virtuoso achievement. Ulmer uses the insistent triangles and inverted pyramids of the interior of Texas State Fairgrounds to invent consistently interesting compositions and environments. In addition, Allison’s arrival at the ruined base is beautifully shot, and its genuine desolation creates an interesting contrast with the unreality of Allison’s first view of the citadel—from documentary to Méliès, or to Emerald City in The Wizard of Oz (Victor Fleming, 1939). One may dismiss this shift in tone as merely the result of a wretchedly inadequate budget; on the other hand, this juxtaposition of apparent incompatibilities may be seen more positively. Each visual element of the film—ruined landscape, external view of the citadel, triangle-dominated interior, space travel—functions with diagrammatic clarity, a boldness of design that overrides their differing degrees of artifice, and that opens for use the whole range of cinema. This boldness reminds me of other artists’ “late styles,” in which a quest for expressive directness presupposes an initially perplexing disregard for established convention. I am thinking particularly, without claiming for Ulmer equivalent achievement, of Beethoven’s last quartets, in which the combination of operatic forms, derivations from sacred music, archaic techniques, and exploratory inventions expresses a coherence deeper than convention can guarantee. However fanciful that may seem, Ulmer certainly combines his visual efficiency with emotional tact, and is courageously willing to forfeit narrative movement or shock effect for more significant ends. One example is how he lets the camera linger on the Supreme after a conference with Allison. Where one surmises that another director would have stuck with the hero or cut to other action, Ulmer lets Allison go, concentrating instead on the Supreme’s moral anguish, shifting the focus from action to thought. Ulmer also reveals Allison’s old age before the last frames, undercutting surprise in favor of both reflection and empathy: the concluding fade-out on Allison’s quivering face (in slow motion?) thus becomes indelibly poignant. Although other science fiction films of the period may be superior, Beyond the Time Barrier is uniquely contemplative, and achieves remarkable poetry within unpromising constraint. In fact, as is characteristic of Ulmer, these constraints are not so much overcome as they are made eloquent in themselves. 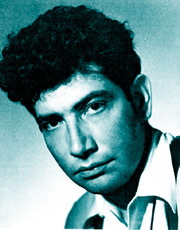 Ulmer was of course only one of the many artists and intellectuals of Central Europe who found their way to Hollywood. Like them he contributed not a little style, sophistication, and depth to the commercial fare which he was expected to produce. 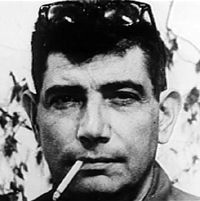 What is remarkable about Ulmer, however, is the extremity of his situation, the sustained and almost unmitigated contact between his talent and artistic tradition on one hand and the lowest rungs of trash culture on the other; and how often this contact did not merely pull Ulmer down to ignominy, but articulated between its two poles some kind of affinity and symbiosis. 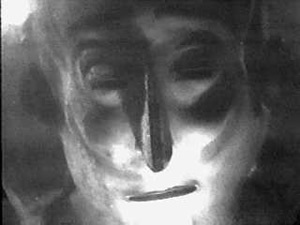 Ulmer’s films often seem like a running reflection on the self-destruction of individuals and civilizations, on the extent of human delusion, rapacity, and ineptitude, in which the impoverishment of his means expresses the tragic limitations of the world he represents. Again, one thinks of Dr. Ulof in The Amazing Transparent Man, the gentle humanist coerced into fatal compromise with evil: “I’m a dying man… I had no choice…. I didn’t do anything by choice.” If Ulof is Ulmer’s stand-in (even with a beloved daughter to protect, the tentative embodiment of a hopeful future), how moving the film’s final address to the audience becomes: “What would you do?” Each of Ulmer’s “morality plays” asks this question; and the ambiguity of the evidence available in answer throws the question back to us, to our own responsibility, our own complicity with imperfectly intelligible circumstances. This is likely incomplete and occasionally inaccurate: Ulmer claimed that he made 128 films, including industrial, training, and commercial projects. Sources vary; I am relying principally on the Internet Movie Data Base (imdb.com). For some European productions, another director received co-credit, to make them eligible for state subsidies. Needless to say, this list does not include Ulmer’s numerous other credits as writer, art director, production designer, etc. Raúl Ruiz, Poetics of Cinema, translated by Brian Holmes, Paris, Editions, Dis-Voir, n.d.
DVD review of The Pirates of Capri. 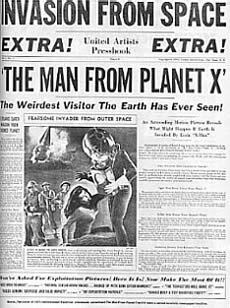 Links to a few online articles here. Discussion of several of his films. Video review of Bluebeard, The Strange Woman and Moon Over Harlem. Also contains images from the films. On Ulmer’s life and work. For more information, see http://www.alldayentertainment.com/ulmer/ulmer.html. See J. Hoberman’s Bridge of Light, Philadelphia, Temple University Press, 1991, for detailed examinations of Ulmer’s Yiddish films and their context. See Peter Bogdanovich, Who the Devil Made It, New York: Knopf, 1997, pp. 601-3. Belton writes, for instance, “If the adjective ‘maudit’ applies to Ulmer’s reputation and career, it also describes his most compelling central characters whose lives are cursed either by fate or by their own irrational behavior”; ibid, p. 147. See Gallagher’s valuable essay, “All Lost in Wonder: Edgar G. Ulmer”, at http://www.latrobe.edu.au/screeningthepast/firstrelease/fr0301/tgafr12a.htm, which emphasizes the visual beauty and eloquence of Ulmer’s work, questions traditional readings of its fatalism, and offers many illuminating and charming reminiscences from Arianne Ulmer Cipes. See Britton’s brilliant analysis in Cameron, ibid, pp. 174-83. In his view Al is “a parasite and an opportunist of the most cynical kind” who “can grasp his opportunities only if he has first disavowed his reasons for doing so” (176), a characterization which his close reading makes quite persuasive. 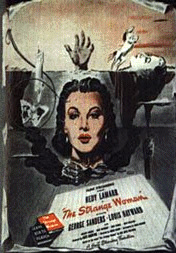 Britton’s high claims for Detour as an incisive critique of gender and social relations under capitalism shed light on other Ulmer films, notably Bluebeard, The Strange Woman, and Ruthless (1948). That Tom Neal would wind up in prison for killing his wife, some years after a scandalous romance with the equally ill-starred Barbara Payton (later to star in Murder Is My Beat) suggests that his performance may have been closer to self-destructive truth than one would wish. This is also roughly the theme of Jive Junction (1944), in which “a high school student trained in the classics (Dickie Moore) starts playing jazz to fit in better at his new high school” (as summarized at Ronnie Cramer’s Cult Film Site http://sepnet.com/rcramer/drama.htm#Edgar%20G.%20Ulmer). For James Agee the whole film is marked by the artistic failure with which Tony achieves such adulation, although “as a gnarled mirror of American musical taste at its worst, and as a record of what various prominent musicians look like under strange professional circumstances, it is a permanently fascinating and valuable show.” See Agee on Film, Vol. 1, New York, Grosset and Dunlap, 1960, p. 251.